There has been a lot of buzz going on in the Magic finance community over the past few months. It all started with Modern. Unless you’ve been hiding under a rock, you’ve noticed that Modern card prices have gone crazy – and will continue to go crazy throughout the summer PTQ season. Then, all of sudden everyone had an interest in Legacy cards. Starcitygames and others have been upping their buylist and sell prices on format staples like dual lands and other cards like City of Traitors, Sneak Attack, Wasteland, and Stoneforge Mystic have all increased significantly in price. Like others have pointed out, this is most likely because people saw that they could trade away or buylist their Zendikar fetchlands for a hefty credit towards the rarer Revised dual lands for Legacy or Commander and decided it was a no-brainer to pick them up. If I would have told you one year ago that Stranglehold would be the third most valuable card from this expansion I’m pretty sure I would have been laughed out of the room. 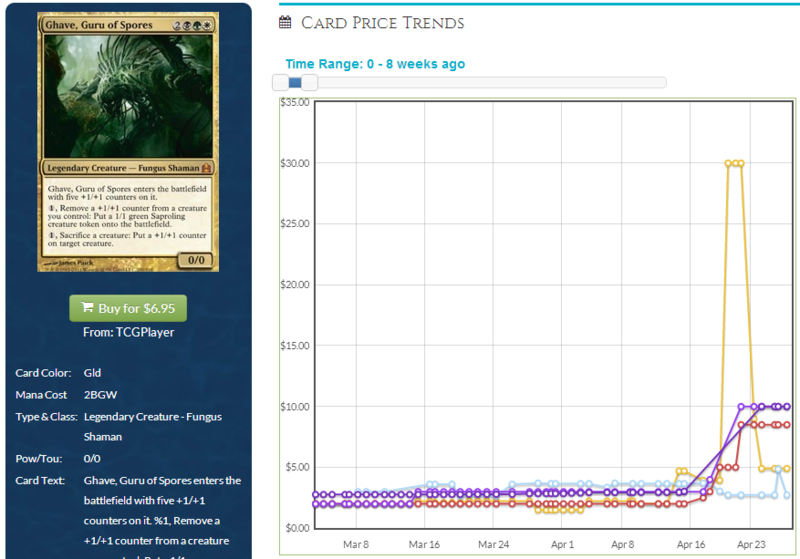 Yet, there it stands at ~$16 trade value below Kaalia and Flusterstorm. Other recent price corrections that have occurred put Edric and Damia in the top five. Edric doesn’t seem very surprising to me because in Legacy he seems like he could provide a lot of benefit to the correct deck. But Damia? That correction was purely from casual demand. Even cards like Ghave are not safe. Two weeks ago he was $2.50 and now has spiked up to $10. Well, spike isn’t the correct term in this case – it really is a price correction based on market demand as more casual players try to build additional Commander decks and stores have followed suit. This makes me wonder what else from the first Commander release has a lot of potential? I’ll separate my cards to watch into several categories to let you know where I think each will fall in the long term. I think that out of all the cards that haven’t corrected in price those listed above are next in line. Most of the cards in this list are legendary creatures from the original Commander precons that were created specifically for that expansion. Outside of future Commander products these cards are very hard to reprint because their lore is so specific. Until new Commander products are released that utilize the wedge colors again I don’t foresee these cards coming down in price. 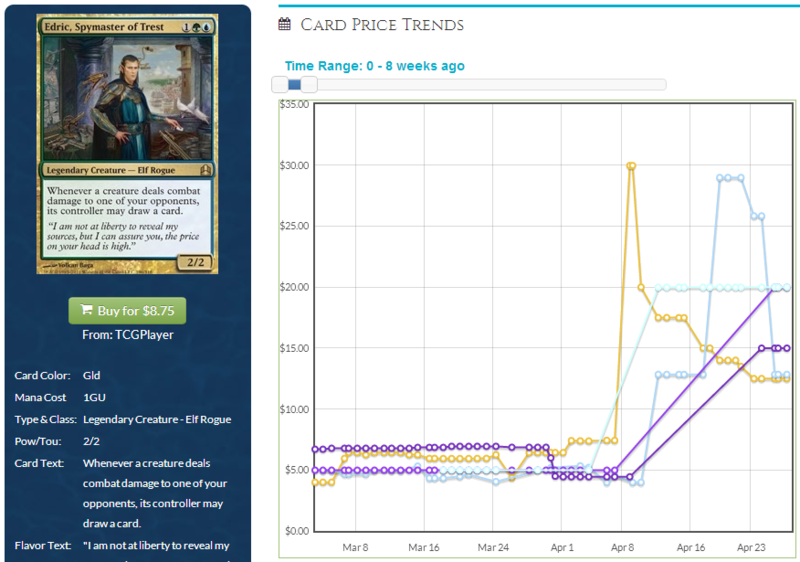 In fact, I can see them continuing to go up due to the rise in popularity of Commander as a format and the fact that they haven’t seen price corrections for quite some time. I put Chaos Warp in this list because I feel that for a removal spell this strong in red, a color that basically has no way to deal with enchantments outside of colorless spells and Chaos Warp, it really has nowhere to go but up. I especially like foils from the Commander’s Arsenal at $25. The only caveat I would give here is that this could possibly be printed in Conspiracy. 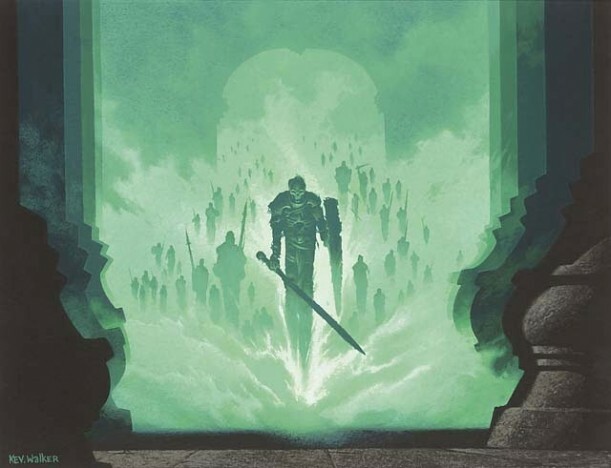 Judging by the power level of the recently spoiled Dack Fayden I could totally see Chaos Warp being in that set just to get more copies out there. Nin could also be a potential inclusion as her ability is very political. The cards here have corrected in price or are already fairly pricey, though now they are at a price where I don’t think they will double up again in one shot. I think they will now slowly creep up over time. Some cards in this category don’t scream “Price correction!” to me but I believe still have a good shot of increasing in price over a longer period. Cards like Tariel, Basandra, Skullbriar, Vish Kal, and Sewer Nemesis are good examples – these are all great casual cards yet they are on the weaker side of the card pool from the first Commander products. I think it will take them longer to reach a higher price than they are currently selling. On the other hand, cards like Akroma, Hornet Queen, Spell Crumple, Grave Pact, and Hydra Omnivore are all solid casual cards that may not see exponential growth (outside of being featured in an eternal format top 8 decklist) yet still have some room to grow in the long run. The reason I don’t think they will price correct as fast as the first category is because Akroma has two printings, the other cards I mentioned aren’t build-around-me cards, and they all require solid commitment to their colors to be included within a deck that utilizes them. Akroma has been seeing some hype recently due to her potential Modern applications, so it could double up just based on that. In the long term though, I believe the price of these cards will have a relatively stable upward trend. I’m also including the cards here that are the most expensive from the set because, frankly, they can certainly get even more expensive. However, due to many of them already increasing in price substantially fairly recently (or already being expensive) they’ll probably take longer than the first category to experience another shoot up in price. Be on the lookout for them to be sure, as most are fairly hard to reprint, though also keep in mind these could take longer to go up again. All of these cards are great casual targets. They all have decent trade value because casual players love to use these in their decks. However, I would be hesitant to pick up extra copies of these cards because they all have seen at least two printings, with a few seeing several, which means that Wizards has no problem reprinting them to get more copies out there. They are also more generic than legendary creatures and can be more easily included in new casual products or future sets. I would only acquire the copies you need and not try to hold onto these in the long term. Scavenging Ooze may be the only exception to this rule as it sees heavy Modern play. Though it is played in 30% of the decks in Modern, it usually only averages about two copies per deck so that could stabilize the price a bit. I thought picking up Scavenging Ooze at around $11 was a good idea and have yet to recover from that (thankfully, I also picked up a ton of Mutavaults at $11 so I guess I’ll take the bad with the good.) I still have hope that Scavenging Ooze can trend upwards in the summer. I will wait until then to see if I can get a better price. If I can, that’s good and I will sell out of my stock. If not, I still plan to sell out because if they don’t rise for Modern this summer it is going to take a while for them to reach $15 or higher. In that time, Wizards could decide that the ooze needs another reprint in Modern Masters 2 or a supplementary product. I want to minimize that risk as much as I can. Looking at the highest priced cards from the first Commander precon set we can see there are a lot of cards that deserve further analysis for future price trends. Trying to predict casual all stars can be hard at times, as casual players usually like cards that I as a spike can sometimes overlook. (Consuming Aberration was pointed out recently to me by Travis.) Who would have thought Stranglehold would be so valuable? I try not to get frazzled by these sometimes capricious prices for casual staples but that is something I am looking to improve upon by writing articles like this. Think I’ve got something completely wrong? 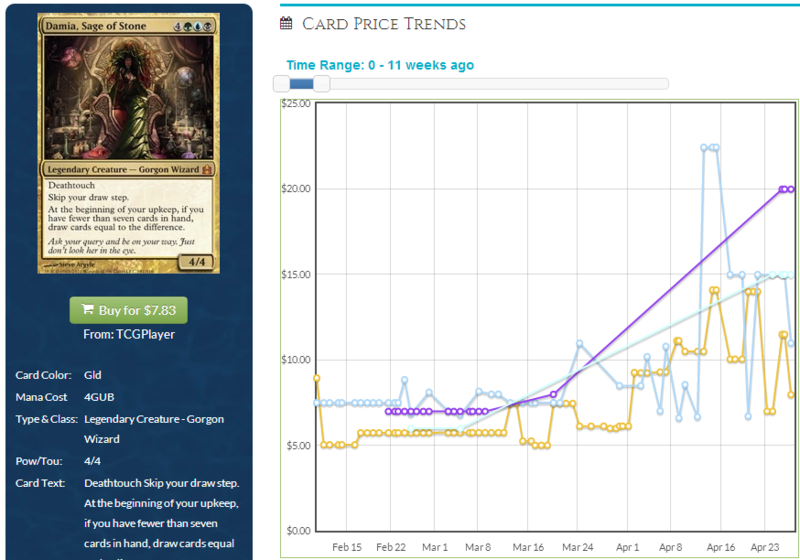 Think I’ve missed anything that is less than $3 retail that is poised to go up over time from the original Commander set? Please, leave me a comment. The more we all know the better we can get at seeing what exactly casual players desire from their cards. Judging from responses by Mark Rosewater and the subsequent contents of Commander 2013, I think Chaos Warp and Hornet Queen are the least likely to get reprints. The main reason is that they are very off-colour effects. Chaos Warp is not in red’s slice and flying is not in green’s slice. These were the new cards in C13 and they all look very on-colour to me. I think he got what he wanted.